The Masters of the Universe screening and Q & A afterwards last Friday night went extremely well. Packed house, great questions. I had a mediocre birthday dinner at the El Cholo in Pasadena. The original El Cholo on Western Avenue is one of the three oldest restaurants in Los Angeles (they have the best chile rellenos, nachos and cheese enchiladas in L. A….and their seasonal green corn tamales — YUM!). It was name-checked by Warren Beatty‘s character in Shampoo. Unfortunately, the food at their Pasadena subsidiary is but a pale shadow of the quality of their original location’s cuisine. Quite frankly, I’ll never eat at the Pasadena El Cholo ever again. On a brighter note, I had my son Andy pick up a Small Party Platter from Bludso’s in Compton yesterday (Sunday). Serving us (four adults, two grandsons) enough food for a small army, Bludso’s is famed L. A. Times Pulitzer Prize-winning food critic Jonathan Gold‘s pick for the best BBQ in Los Angeles. He’s right! Everything was amazing, especially the ribs, chicken and beef brisket. Absolutely loaded with smoky flavor! Like eating meat if meat was candy! Bludso’s, you made my day (and made up for that crappy meal at El Cholo)! 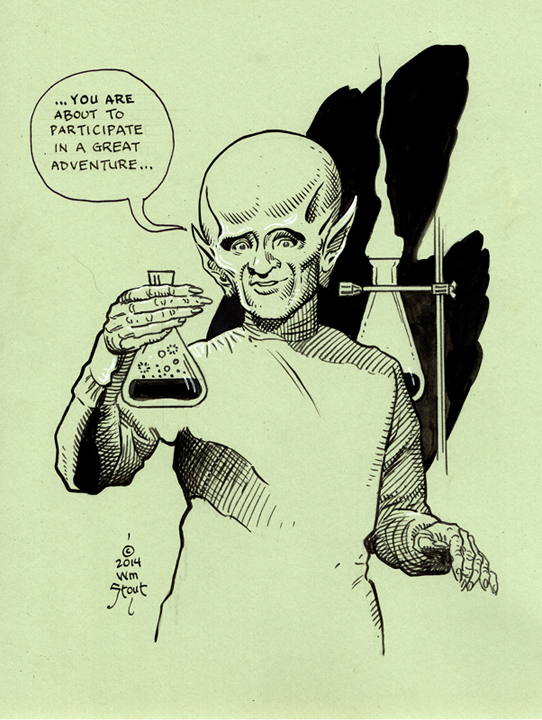 Back to Business: Continuing a new series of sales of original William Stout art related to Outer Limits, from an Outer Limits-themed art exhibition. Black & white inks on acid-free heavy paper card stock. It’s for sale in the “Original Art” section in my website Store‘s Bazaar. This entry was posted on Monday, September 21st, 2015 at 9:19 am	and is filed under Misc.. You can follow any responses to this entry through the RSS 2.0 feed. You can leave a response, or trackback from your own site.